Two weeks ago, we looked at the Second Amendment and determined that it prohibited any federal infringement on the right to keep and bear arms, and that the prohibition even includes restrictions imposed while exercising legitimate federal power. This week we will look at the connection between the militia and the Second Amendment. All of them, not just a select few. The right to keep and bear arms flows from an even deeper philosophical spring – the natural right of self-defense. In his paper, The History of the Second Amendment, legal scholar David Vandercoy traced the right back to Blackstone and English common law. Blackstone described the right to keep arms as absolute or belonging to the individual, but ascribed both public and private purposes to the right. The public purpose was resistance to restrain the violence of oppression; the private was self-preservation. Blackstone described this right as necessary to secure the actual enjoyment of other rights which would otherwise be in vain if protected only by the dead letter of the laws. That said, the existence, preservation, and autonomy of the militia was intimately tied to the Second Amendment, and was the driving force behind its inclusion in the Bill of Rights. It was not only intended to preserve an individual right to keep and bear arms, but also to limit government power. It was understood that an armed populace would serve as a check against government encroachments on liberty. A typical progressive argument to justify federal bans on certain types of weapons despite the Second Amendment goes something like this. Actually, the founders weren’t dumb. I’m pretty sure they realized more powerful weapons would come along. I have no doubt humans will develop even more effective ways of killing each other in the future. It seems likely people as smart as Thomas Jefferson, James Madison and George Washington at least imagined the possibility that more effective and deadly firearms would evolve with time. But whether they did or didn’t forsee advanced weaponry misses the crucial point. The purpose of the Second Amendment wasn’t to ensure people could go hunting. It wasn’t even primarily meant to ensure people maintained the ability to defend their homes and families, although that was important. Fundamentally, the Second Amendment was included in the Bill of Rights to ensure the people would always have the means to match the firepower of a federal army. It was intended to ensure the people could resist tyrannical government with force in the last resort. The founding generation understood that an unarmed populace would open the door for the government to trample its liberties. In simplest terms, the Second Amendment was meant to ensure the people could take on the government if necessary. Consider the words of Noah Webster in An Examination into the Leading Principles of the Federal Constitution. During the ratification era, many feared the provision in Article 1 Sec. 8 delegating to the general government the power to “provide for organizing, arming, and disciplining, the Militia,” would allow it to disarm the militia, leaving the people of the states at the mercy of a national standing army. They viewed this as a direct threat to liberty itself. 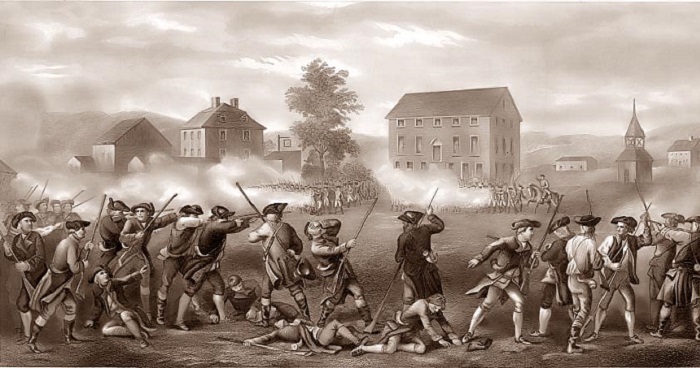 The American colonists had firsthand experience with government attempts to strip away their means of self-defense. In fact, British efforts to disarm the American colonists led to the first shots of the American Revolution. The Red Coats marched on Concord with the explicit purpose of capturing or destroying guns and powder belonging to the colonial militias. During the Virginia ratifying convention, George Mason referred to British efforts to disarm the colonists as he argued for the need to protect the right to keep and bear arms. Forty years ago, when the resolution of enslaving America was formed in Great Britain, the British Parliament was advised by an artful man, (Sir William Keith) who was governor of Pennsylvania, to disarm the people; that it was the best and most effectual way to enslave them; but that they should not do it openly, but weaken them, and let them sink gradually, by totally disusing and neglecting the militia. [Here Mr. Mason quoted sundry passages to this effect.] Why should we not provide against the danger of having our militia, our real and natural strength, destroyed? The general government ought, at the same time, to have some such power. But we need not give them power to abolish our militia. The local militia was the check against government power. Some will concede this point, but argue this only proves a select group of people – the militia (the National Guard) – gets to have access to weapons. They say this does not extend the right to keep and bear arms to individuals. This reveals a fundamental misunderstanding of the makeup of the militia. It wasn’t an exclusive body of military men. The militia was made up, as Mason said, of “the whole people.” The militia existed as a body distinct from the government. It could be called up by the government, but it maintained some level of independence. In fact, Mason expressed fear that without an explicit amendment protecting the right to keep and bear arms, the militia would be reduced to an extension of the federal government itself – not a body of people equipped to resist government tyranny. The author of Letters from a Federal Farmer echoed Mason’s argument. In fact, that was the point. They wanted the populace to both to possess military equipment and to have the ability to use it. They wanted to ensure the people could resist the government – by force if necessary. When you bring up this idea up today, a lot of people laugh it off, claiming a bunch of rednecks with AR-15s could never face down the U.S. military. Well, tell that to Afghani nomads and Vietnamese peasants. Rob Natelson sums up the scope of the Second Amendment in The Original Constitution: What it Actually Said and Meant. The Second Amendment served purposes besides buttressing the natural right of self-defense and the reserved power of armed resistance. By guaranteeing continuation of the state militias, it strengthened state power in the state-federal balance – even though state militias could be called into federal service. By protecting the militia, the amendment promoted citizen involvement in government military affairs, just as the jury system promoted citizen involvement in judicial affairs. Likewise, by protecting the militia, the Second Amendment reduced the need for federal standing armies. One does not have to be an advocate of violent revolution to recognize the danger of allowing the government to have a monopoly on guns. It’s a matter of balancing power with power. The government will be far less likely to become tyrannical or oppressive when the people maintain the ability to resist. When you remove the option of self-defense, it tips the scales of power toward the government. That opens the door to tyranny. Technology has certainly changed over the last 250 years. Human nature hasn’t. Government is still prone to abuse the people when it can get away with it. Power still corrupts. Absolute power still corrupts absolutely. I would say that (1) the experience of the Swiss, whom have universal conscription and ISSUE their personal arms to the discharged soldiers, to be drilled with as reservists, but still retained afterwards, without the streets of Zurich or Geneva being shot up, nor the Swiss government being considered as oppressive to its several citizens and (2) the experience of our own military in dealing with insurgencies, far less successfully than with formally equipped and deployed “regular’ military forces of the opposition (in general, our forces have utterly pasted the opposition in the field with little effort), points out that indeed the citizens of this country could, if there were a dire need, successfully mount a guerrilla campaign against an oppressive Federal Government and cause its downfall. The idea, of course, is that things never degrade to that point!